They say that the most important news (to blog about) is the “events” you personally witness or initiate (in a constructive sense). So here we go. I have something to announce! Yesterday, Thursday September 29, 2011 I changed the “look” of my home page for my main website doaskdotell.com. For policy reasons, I’ll invite the visitor to just type it into the browser line (it’s not that hard to do). And on Monday, September 19, 2011 I had uploaded a copy of my new E-book, “Do Ask Do Tell III: Speech Is a Fundamental Right; Being ‘Listened To’ Is a Privilege”. It can also be called “Do Ask Do Tell 3” (like a movie sequel). I’ll discuss soon on my Books blog how I am distributing it. As for the web page, I decided a “simpler look” was appropriate, and particularly a setup that would tell visitors what I have done more recently and what I am working on “now” – which is, so to speak, mainly to market my screenplays and resurrect some music I had composed as a teenager and young adult. I am not yet offering separate mobile access, and I think that a simple tabular (and columnar) approach to the page (readily accomplished in Microsoft Expression Web) was appropriate. This may a good time to note that I have two “names”: A legal name, of John William Boushka or John W.. Boushka, and a nickname (given at birth in 1943 by my parents) of Bill Boushka, with the “Bill” derived from the middle name “William” (sorry, not England’s prince, but I went bald early, just like “he” has). 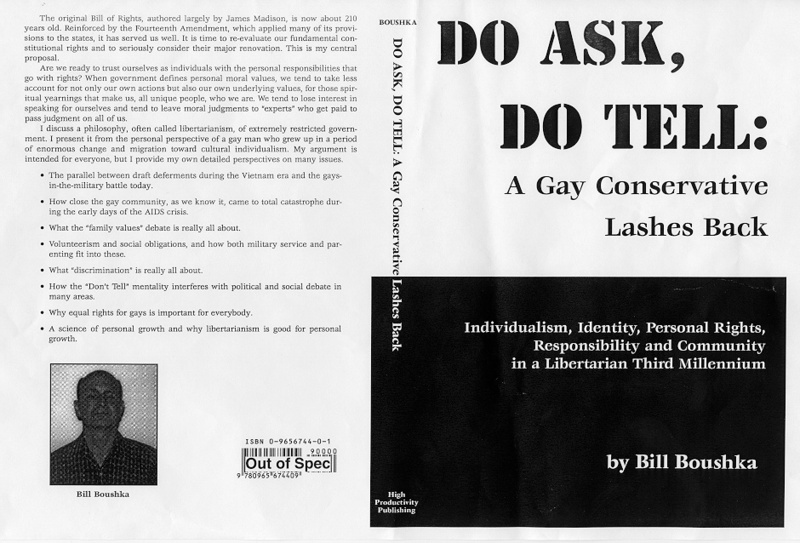 I have used “Bill Boushka” as a quasi-pseudonym, and it is the name I publish my books under. “Doaskdotell.com” is the main site, with links to the blogs and all my books, including e-commerce information, book text online, and various supporting materials. These have accumulated over the years and become voluminous. It runs on a Windows Server platform, share-hosted by Verio. There is still a possibility that I may use the Windows SQL Server features there for a database project on “Opposing Viewpoints” or to cross-reference my media reviews. “BillBoushka.com” is an experimental site, with reduced content but a special “Technical-Legal Confluence News” blog, which I have not updated as faithfully as “The Fab 16” on Blogger. It runs on a Unix platform, share-hosted by Verio. It’s main practical value, besides the Wordpress blog, is that it hosts an experimental “Opposing Viewpoints” database in MySQL. “JohnWBoushka.com” hosts my “professional” resume, with respect to my previous career in “mostly mainframe” information technology. It is hosted by Network Solutions (I presume on Unix). The need for such a site is less evident now, given my recent shift in emphasis. But generally I don’t give up domains. However, until 2006 it had been hosted by a different provider (which failed) where I tried some java experiments. Much of the material on “doaskdotell.com” was at one time (until 2005) on a domain called “hppub.com”, an acronym for “High Productivity Publishing”, under which I had self-published my first two books before 2000, which I switched to iUniverse. I had established “Doaskdotell.com” in 1999. I merged hppub into doaskdotell.com in the summer of 2005. Now I use “Doaskdotell.com” as the name of the publishing entity, on an informal basis. It has been common for authors, especially those with difficult-to-spell “foreign” names, to write under nicknames or pseudonyms (in the 19th Century, women took on the names of men). In recent years, both Facebook and now Google+ have insisted that people use “real names” and maintain singular identities, as evidence of “integrity” and to prevent abuse of anonymity and security problems on their social networking sites. On Facebook I use my legal name “John W Boushka”. I don’t use the Myspace entry now much, but it looks like I have used both the names “Bill” and “JBoushka” there. On Twitter I’m “JBoushka”. My Facebook and Twitter links are on the contact page accessible from the doaskdotell.com home page (top row). My loose usage of my “name” had developed well before the more recent concerns about “online reputation” had developed, and before social networking sites started insisting on integrity in the use of personal names. It had long been accepted practice in the “Web 1.0” world under which I had “come of age”. Electronic Frontier Foundation and the ACLU have vigorously defended anonymous and pseudonymous speech (which overseas is sometimes absolutely necessary to stay out of prison). I will have to think carefully about my further self-identification policy, and may have to contact the various providers. It is not easy to make them consistent across all service providers, when I joined up at widely different times and when they have differing corporate policies on the matter. I have placed BOTH by nickname and now my legal name on my doaskdotell.com home page at the bottom so that search engines can try to link them as equivalent. I am not yet removing any content, since it is embedded in the search engines (and even the Internet Archive, which also shows hppub.com materials).